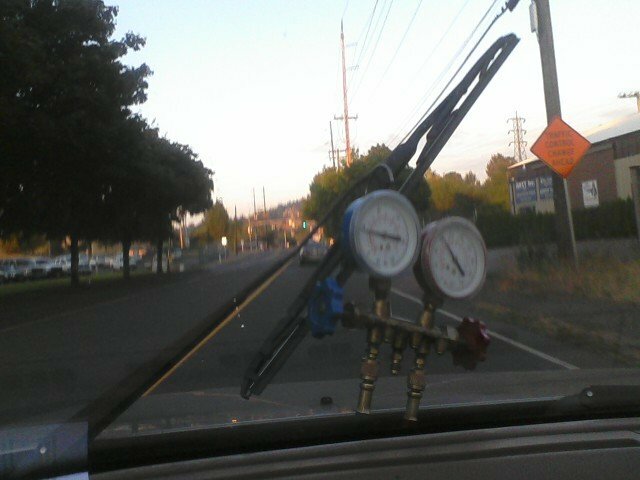 system pressure goes up high but when its driven on the road, A/C works fine. Vent temperature is not right when on the road. This is the setup I use to check if its RPM dependent or speed dependent as well as help any evasive issues. You'd want to enlist the help of a passenger or have someone else drive it while you observe for safety reasons. Hope you have insurance that covers cracking the customers windshield. Get a good shop fan. What good does that link do for ANYONE not from the State of California? In that state, windshield mount GPS constitutes illegal obstruction while they're permitted in most other states. California is not the world, in case you didn't realize. Actually I was hoping that link would do you some good and help you to realize what a stupid and potentially dangerous setup you rigged up, and that you would be much better off just using a fan in front of the vehicle for your testing purposes. But if you prefer to insult forum members who give you basic common sense advice then stick to that. A traffic cop is not going to like that setup, you WILL get pulled over even if not actually illegal as a windshield obstruction, it's still making the windshield wiper non-functional and it's not going to take much for that spring-loaded wiper arm to snap back and crack the windshield. Be sure to carry a copy of your online EPA certificate with you so you can explain to the Police Officer and insurance claims adjuster that you're conducting an AC function test and therefore authorized to drive around with a refrigerant gauge set zip-tied to the windshield wiper. You seem to be quite the expert on California-specific items such as the CA refrigerant cans, so by deduction I simply assumed that you're from California and thus linked to the CA code regarding windshield obstruction. One last observation on your test rig, why is there no cap on your center fitting? Is that so you can adjust the refrigerant quantity while driving around? It looks like a really cool way to illegally vent refrigerant, huh. Let's just hope the cop that pulls you over doesn't know the first thing about EPA regulations. (a) unless the windshield and the windows on either side of the compartment containing the steering wheel are in such a condition as to afford the driver a clear view to the front and side of the motor vehicle; and ..."
(h) there shall be no star, stone chip or crack in the area of the windshield swept by the driverÃ¢ÂÂs wiper blade, that may interfere with the driverÃ¢ÂÂs vision; and ..."
I would suspect you might avoid a ticket if the gauges were mounted on the passenger side, down low were the hood blocks the view of the road anyway. But mounted to the driver's side wiper probably isn't the best place. I would also suspect that every jurisdiction on the continent has some sort of requirement to keep the driver's view substantially unobstructed. I fail to understand your deduction that lack of center cap equals release. It's left blank, because center hose isn't attached. No EPA regulations are violated because nothing is vented. The center port is inactive when two valves are turned off. I'm mentioning this as I'm not sure if you know how manifold gauge set works. But following all technicalities, a lot of cars that go to shops can not be driven legally. If a car comes into a shop for transmission concerns but the taillights are not working, vehicle code does not allow it to be driven on public roads. Same with windows that have cracks. No real idea how a manifold gauge set works, still trying to figure out how to use my halide torch I bought in 1977. Misplaced the instruction manual about 35 years ago and been without a clue ever since. That wiper rig is super hokey. Duct tape FTW. You could also buy longer hoses if necessary and run them in through the side window. Either way this is a two person operation, one tasked strictly to drive safely and watch the road, and the other (the A/C expert) in the passenger's seat watching the gauges.